Origin and Habitat: Vosfontein, Western Cape, South Africa. Description: Conophytum hillii is another species of the Conophytum uviforme complex distinguished by grey-red bodies. Note: Conophytum uviforme is a very variable species comprising many morphological and geographical variant that was early classified as different independent species. Nowadays all this plant are considered part of a multiform species, where each form is linked to others by populations of plants with intermediate characteristics. Habit: Conophytum hillii is a dwarf perennial succulent, up to 4 cm tall often forming fairly large mats or domes. Some specimens are very attractively coloured and marked. Bodies (Paired leaves): Small, globose to egg-like, apex sometimes slightly bilobed or truncate, glabrous or covered with short, thick trichomes, pale grey-red, with more or less numerous dots on the top. In spring the colour of the old leaves fades, and they shrivel to a thin dry sheath that protects next season's growth during the summer resting phase. Flowers: Solitary with a prominent perianth tube, petals white, beige or straw coloured, rarely pale pink or carmine. The stamen in a central column. 9) Erhardt, W. et al. 2008. "Der große Zander: Enzyklopädie der Pflanzennamen." 10)Germishuizen, G. & N. L. Meyer, eds. 2003. "Plants of southern Africa: an annotated checklist." Strelitzia 14. 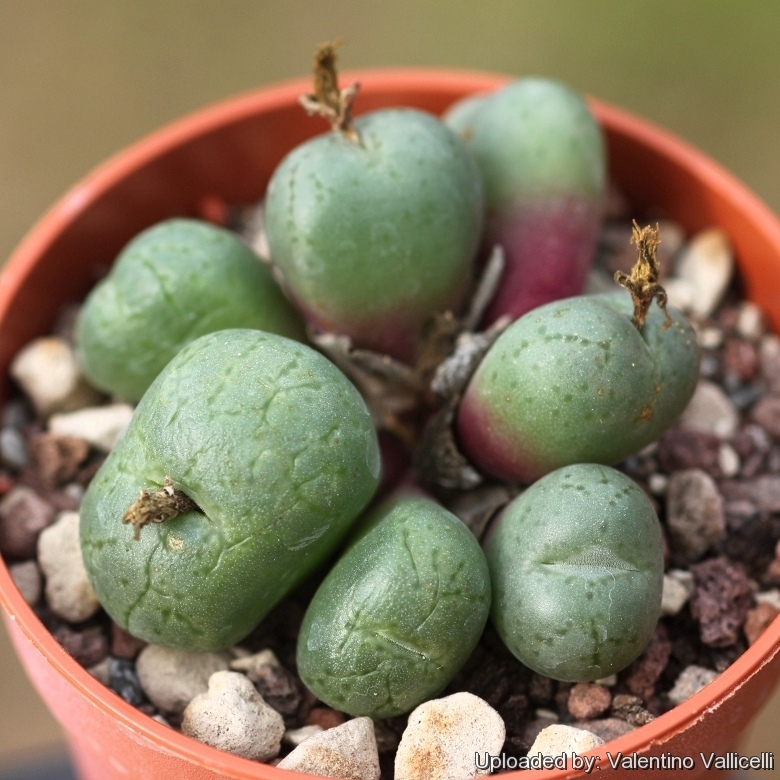 Cultivation and Propagation: Conophytum hillii is a "winter" grower which is most active from late winter until later spring and heading for summer dormancy, but in favourable growing conditions it keeps going over the summer too and doesn't need particular care. All the forms of Conophytum uviforme have the advantage of extreme ease of growth.